Our Champion heritage tee, available in solids and prints, is heavyweight 7 ounce. Jersey fabric. 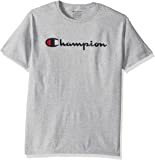 Champion graphics are truly inspired by our archives and our long history of athletic wear. 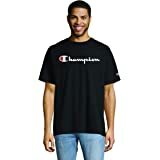 Champion - a step above. 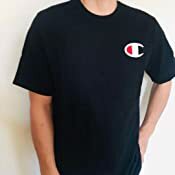 Fits decent, quality is decent but different then a different champion shirt i have. No real complaints other then the fact it smells like someone may have died in it. Great quality but this t-shirt is a slim fit so you may want to go up a size when ordering! 3.0 out of 5 starsSuperbe si l'on aime être serré aux entournures. Détente et loisirs. Bonne qualité. Belle couleur grand teint. Un regret le médium est plutôt petit ou alors j'ai pris 3 kilos le temps de l'essayer. Fit was good. Quality is not really good , the fabric used is not the good type of cotton. 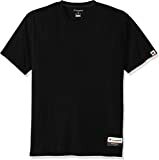 It feels like a Goldman shirt with a champion logo printed on it. Not that worth the price. the tee colla is so small and the tee is so long.